Why does the horse on display at the supermarket have a sheath? Front and back views. The lighting is pretty harsh there, especially looking towards the front of the store. Yes, the horse appears to be a gelding. b) that's where the main ingredients come from? Why are there no balls? I added a couple more pics. The horse appears to be a gelding. The new one on 144th and Stony Brook Blvd (near where Millard Ave splits off from 144th). I usually buy meat from Costco. They have USDA Prime ribeye steaks for $10.99 a pound; most supermarkets charge that for USDA Choice. Is this a gelding or did you not want to be too obvious in your picture taking? I was thinking along the same lines as mejeep, that maybe that's the spigot. I added a couple pics. Yes, the horse appears to be a gelding. This country has an aversion to all things scrotum. That's not a political statement, either. 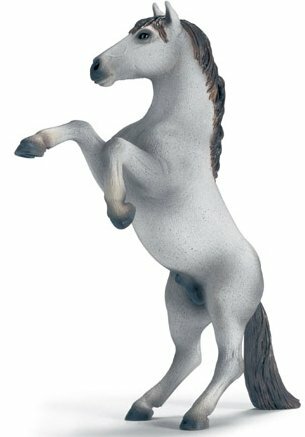 Most Schleich figurines are anatomically correct, and not just the horses. Bulls, pigs, dogs, lions you name it. It's a Clydesdale, for pete's sake. If it doesn't have a wang, it'd look like it was defective. Reminds me of a time at the farm in the Children's Zoo. Little girl looks up at the raised paddock, where one of the zoo's Clydesdales is munching some hay. "Mommy I think it's a boy horse." Whap! The mother hit the girl. I was shocked. I mean, from the point of view of somebody so short, how could you miss it? Or are girls defective by definition?